On January 16 2001, Don’t Tell Me was released commercially in North America as the second single from Music. Written by Madonna, Mirwais & Joe Henry, the song was Madonna’s first collaboration with her brother-in-law, whom she had known since high school. Henry sent a demo (then titled Stop) to Madonna after his wife, Melanie, insisted that her sister would love the song. Madonna & Mirwais drastically altered the music and melody and renamed the song Don’t Tell Me. Henry released his version on his eighth studio album, Scar, in May 2001. The maxi-single featured remixes by Thunderpuss, Timo Mass, Victor Calderone, Richard “Humpty” Vission and Tracy Young. 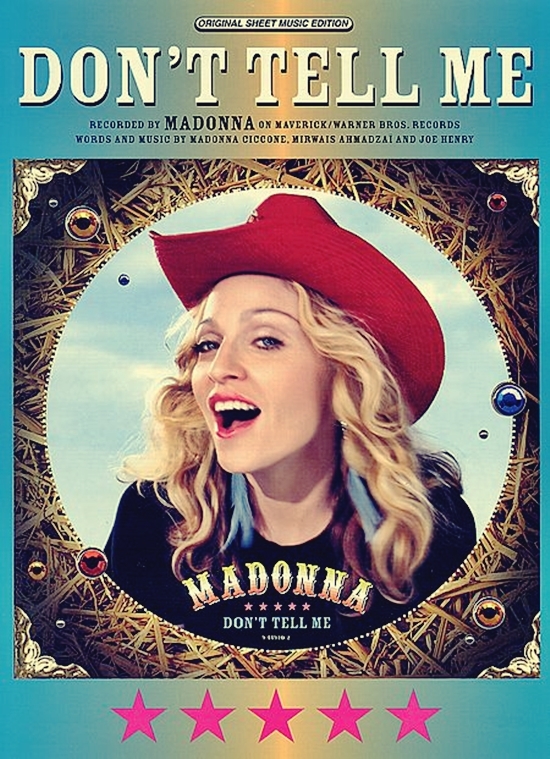 Don’t Tell Me was the last Madonna release to be issued on cassette single in the U.S. and was also available on 2-track CD single, CD Maxi-Single (enhanced with the music video) and as a double 12″ vinyl set. In Canada, it was released only on CD maxi-single. Don’t Tell Me is a brilliant Art Rock/Alt-Country Detroit Rock City Madonna Artwork because it encapsulates and captures who Madonna is and what she’s all about! Quality Rock in the Driver’s Seat! Madonna Does It Again!